"The best result on dark matter so far—and we just got started." This is how scientists behind XENON1T, now the most sensitive dark matter experiment world-wide, commented on their first result from a short 30-day run presented today to the scientific community. Dark matter is one of the basic constituents of the universe, five times more abundant than ordinary matter. Several astronomical measurements have corroborated the existence of dark matter, leading to a world-wide effort to observe dark matter particle interactions with ordinary matter in extremely sensitive detectors, which would confirm its existence and shed light on its properties. However, these interactions are so feeble that they have escaped direct detection up to this point, forcing scientists to build detectors that are increasingly sensitive. The XENON Collaboration, that with the XENON100 detector led the field for years in the past, is now back on the frontline with the XENON1T experiment. The result from a first short 30-day run shows that this detector has a new record low radioactivity level, many orders of magnitude below surrounding materials on Earth. 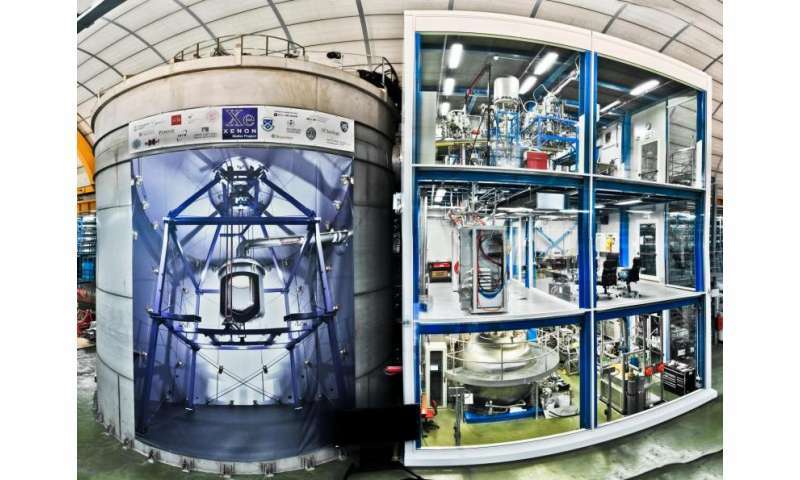 With a total mass of about 3200kg, XENON1T is the largest detector of this type ever built. The combination of significantly increased size with much lower background implies excellent dark matter discovery potential in the years to come. The XENON Collaboration consists of 135 researchers from the U.S., Germany, Italy, Switzerland, Portugal, France, the Netherlands, Israel, Sweden and the United Arab Emirates. The latest detector of the XENON family has been in science operation at the LNGS underground laboratory since autumn 2016. The only things you see when visiting the underground experimental site now are a gigantic cylindrical metal tank filled with ultra-pure water to shield the detector at his center, and a three-story-tall, transparent building crowded with equipment to keep the detector running. The XENON1T central detector, a so-called liquid xenon time projection chamber (LXeTPC), is not visible. It sits within a cryostat in the middle of the water tank, fully submersed in order to shield it as much as possible from natural radioactivity in the cavern. The cryostat keeps the xenon at a temperature of -95°C without freezing the surrounding water. The mountain above the laboratory further shields the detector, preventing perturbations by cosmic rays. But shielding from the outer world is not enough since all materials on Earth contain tiny traces of natural radioactivity. Thus, extreme care was taken to find, select and process the materials of the detector to achieve the lowest possible radioactive content. 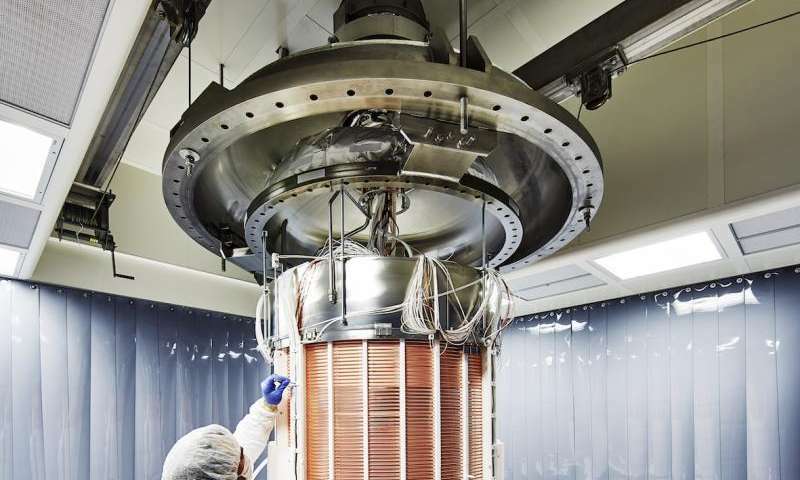 Laura Baudis, professor at the University of Zürich and professor Manfred Lindner from the Max-Planck-Institute for Nuclear Physics in Heidelberg, emphasize that this allowed XENON1T to achieve record "silence," which is necessary to listen for the very weak voice of dark matter. A particle interaction in liquid xenon leads to tiny flashes of light. This is what the XENON scientists are recording and studying to infer the position and the energy of the interacting particle, and whether or not it might be dark matter. The spatial information allows the researchers to select interactions occurring in the one-ton central core of the detector. The surrounding xenon further shields the core xenon target from all materials that already have tiny surviving radioactive contaminants. 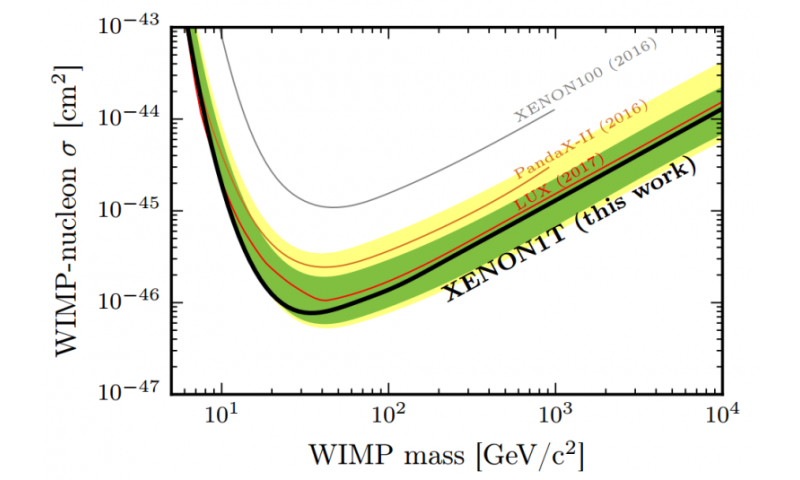 Despite the shortness of the 30-day science run, the sensitivity of XENON1T has already overcome that of any other experiment in the field, probing unexplored dark matter territory. "WIMPs did not show up in this first search with XENON1T, but we also did not expect them so soon," says Elena Aprile, Professor at Columbia University and spokesperson for the project. "The best news is that the experiment continues to accumulate excellent data, which will allow us to test quite soon the WIMP hypothesis in a region of mass and cross-section with normal atoms as never before. A new phase in the race to detect dark matter with ultra-low background massive detectors on Earth has just began with XENON1T. We are proud to be at the forefront of the race with this amazing detector, the first of its kind." So, we got nothing, but it's better nothing than before. Okay. 6 paragraphs and a pretty graph with no data... title lies. What sort of a reaction is hypothesized between dark matter and ordinary matter? What sort of energy levels are expected? Given mass, velocity, charge, etc, what would be the expected cascade of events showing it happened? They state that dark matter is five times more abundant than normal matter, as though it's a fact. Their proof is that astronomical observations have indicated it. But that's only if you interpret the astronomical data that way. Oddly, all the dark matter "halos" just happen to surround large quantities of normal matter, as in galaxy-cluster-sized masses. The only halos that are not centered on the normal mass are when the galaxy or cluster is moving at very high velocity (or is there only one of those?). Uh, if the halos are always centered on the mass of normal matter, isn't it much simpler to say there's only normal matter, and your theory of gravity is incomplete? Especially when we know it is incomplete in the first place? And the one instance where the halo is off-center could be that you're seeing lag in the effects; we are talking about extremely huge masses and distances here, so the lensing of distant objects behind the cluster could play out over millions of years. As I understand it, dark matter is conjecture based on ambiguous observations and bad math. The inference for its existence arises from the observation of the behavior between colossal objects extremely far away, so now they are trying to find it around here. from: "10 Facts Everyone Should Know About Dark Matter", on the fact that we can't just see it.. It means it doesn't emit any electromagnetic radiation for all we can tell. Astronomers haven't been able to find neither light visible to the eye, nor radiation in the radio range or x-ray regime, and not at even higher energies either. Well, that perfectly describes helium. 5. Dark matter doesn't interact much with itself or anything else. That perfectly describes helium too. 10. But we have no direct experimental evidence. Bingo! Just keep pumping all that money into useless experimentation. As I understand it, dark matter is conjecture based on ambiguous observations and bad math. Well, then we can definitely conclude that you don't understand it at all. Oddly, all the dark matter "halos" just happen to surround large quantities of normal matter, as in galaxy-cluster-sized masses. isn't it much simpler to say there's only normal matter, and your theory of gravity is incomplete? It's not simpler. It's much harder to incorporate such an explanation into the current set of theories. Note: when you make a statement it doesn't just have to mesh with one observation. It has to mesh with ALL observations. Is there a simple explanation for the climate change denial grade of odd comments appearing here? So they've made a detector and it is probably working? Result! Yo hey. It's the hydrino. Pass it on. @TheGhostofOtto1923 While I share your enthusiasm regarding the BrilliantLight power, I don't think that the hydrinos are responsible for it. If their formation would release so much of energy, then the hydrino would be way more frequent in the universe and representing substantial portion of stars and large planets, because it would be also difficult to decompose. Other than that, the WIMPs woulds share many aspects of behavior with hydrinos (mass, zero charge, etc..), if they would exist both. Well as you might suspect Dr Mills has thorough explanations for your doubts which I'm certainly not going to try to repeat them here. But I suspect you haven't chosen to search them out yourself but rather assume you can naturally out-think him without having to check? That's the way it appears at any rate. I would appear its due to bad math. What is the "faint annual variation" that they detect in previous detector? The DAMA/LIBRA project claim it was dark matter in 1998, but the previous project (XENON100) ruled it out. So, what is the annual variation? Why don't they just read up about all the pieces of evidence for electricity as the main agent for all the effects they purport to find with dark matter. This Dark matter business is too sad to watch. Dark matter researchers clearly are unaware of the details and explicative power of the alternatives. They must read up about it and come to understand that scale invariant electric phenomena and currents exist in space. Electromagnetic force is responsible for gravitational effects and it is a far more elegant theory able to explain all observed phenomena in great detail, without having to resort to the complex theoretical house of cards that dark matter hypothesis is. Well I hope they continue to fail to create an over unity device considering any over unity reaction could lead to the utter destruction of the entire universe. E = MC^2 over unity = infinite energy = bye bye everyone. Think of a nuclear reaction with unlimited nuclear material. The power plant at Niagra Falls is an over unity device. It was first built in 1895, and we are all still here.